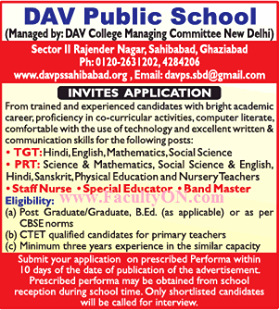 DAV Public School, Ghaziabad has advertised in THE TIMES OF INDIA for the recruitment of TGT plus PRT job vacancies. Interested and eligible job aspirants are requested to apply with in 10 days. Check out further more details below. About School: D.A.V. stands for Faith in the eternal values of Vedic culture and study DAV Public School, Sahibabad, NCRof Modern Indian Language, Science and Technology. The school is committed to academic excellence, art, athletics and intellectual growth of the students. It also aims at inculcating strong moral and social values in the students. D.A.V. Public School, Ghaziabad (U.P.) was established in April 1984 under D.A.V. College Managing Committee, Chitragupta Road, New Delhi with 60 students and 7 teachers. Today it has its own magnificent spacious building spread over an area of 10 acres with Facilities for academics, games and sports. It has about 4600 students and staff spanning over 250.